This week has been quite a roller coaster with Isla. She has been an absolute delight the vast majority of the time. She is so funny, and sweet, and so clever….and oh so cheeky! But then there are times where….she has tested our patience. Maybe it’s the Terrible Twos. Maybe our busy weeks, weekends, and the lack of naps these days is catching up with her? Who knows. But I’m hoping it doesn’t last much longer. We have had a lovely week though. On Monday I didn’t see much of Isla, she was at nursery in the afternoon, and then I was in London seeing Everybody’s Talking About Jamie with the lovely Sammi O’Neill, who was reviewing it for Theatre South East (click the link to read her review, and to buy tickets!) Tuesday to Thursday were pretty chilled out days at home (despite the biggest spider in the world sitting right above me on Tuesday morning making me want to leave this house forever! ), with lots of painting, playdoh, jigsaws, toys, and ice lollies. And on Friday we went to Odd’s Farm with friends. We both love it there. Unusually for Isla, she didn’t seem too fussed about the soft play. Maybe it’s because it was so busy in there due to school holidays. But she asked to go outside, so we headed down to the water park. Swimming costumes on, sun screen on, sandals off. And she was splashing away for ages! She had such a great time. Saturday wasn’t quite so good….our plans to go swimming were foiled by not checking the time table, the Subway deal we were going to get didn’t go to plan as we could only use our voucher in London….Daddy went to the football, and didn’t take Isla with him (queue a mahoosive melt down which was only fixed with booboo, ice lollies, and Bing!) We did have another teary moment though when Bing (CBeebies character) trapped his finger in the letter box….so Isla started crying! Oh dear! Sunday was lovely though, we all had breakfast in bed, and then went swimming. Isla loved it, and was squealing and splashing with delight. We did some cooking (chilli for the freezer, which Isla decided she wanted for dinner, so I had to pick all the kidney beans out for her!!) and we did some gardening, which Isla loved helping us with. This weeks photo was from Sunday afternoon. 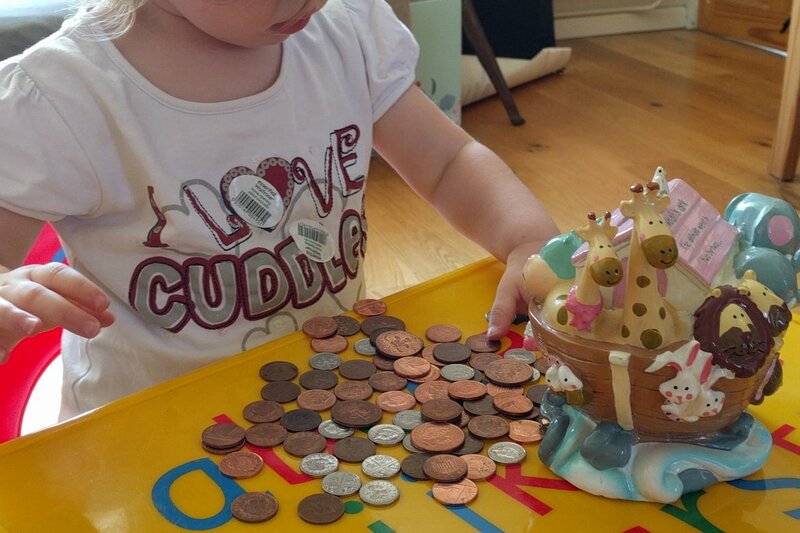 We’d had to borrow some change from Isla’s money bank for car parking (I know, such bad parents, but it has been replaced already) But the money and money bank were all left on the living room table. Isla decided she wanted to play with it all. She loves to “pay the lady” at the shops…whether it’s a lady or a man at the till! 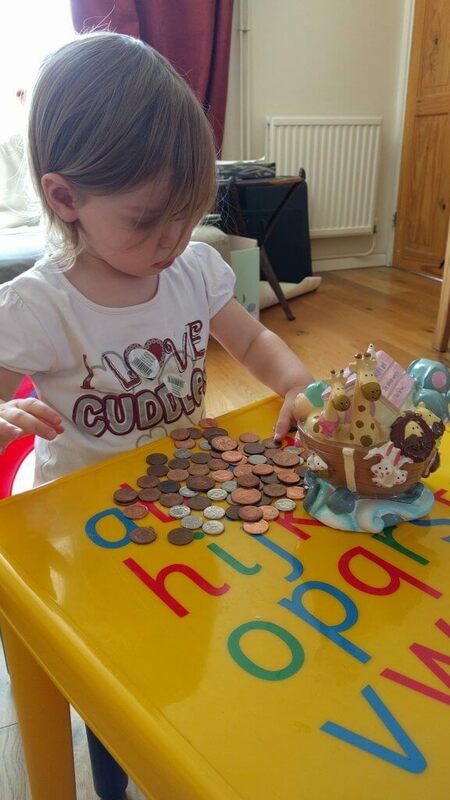 Isla then spent ages putting all the coins back in her money bank. I love it. I used to play with my parents’ copper coin jar when I was younger. I loved counting them all. I guess the photo just takes me back a bit. And yes, she does have barcode stickers on her t-shirt. So I’m sorry if you were trying to buy avocados in Waitrose yesterday and couldn’t scan them…Isla stole a LOT of the stickers!